The smell of Thanksgiving food, and the sounds of fellowship and fun were in the air Thursday at Applebee’s in Salina. The only thing on the menu was turkey, and all the trimmings. 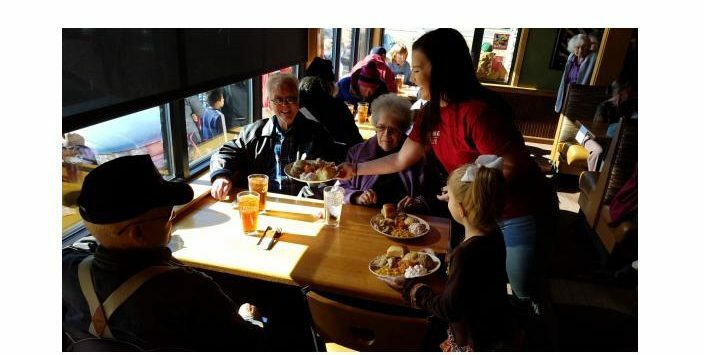 For over two decades the Salina Salvation Army has served a free community-wide Thanksgiving meal at the South Salina restaurant. People begin lining up outside in the warm sunshine at 9:30, a full two and a half hours before the doors were scheduled to open. The volunteers inside, and the food, were ready to go so they opened the doors about 10 minutes early. This was the second Thanksgiving event in Salina for Captain Lynn Lopez. She was all smiles as she stood by a red kettle and greeted people as they entered. She told KSAL News she was “blessed and privileged” to be able to share such an event with the community. Lopez said an event like this wouldn’t be possible without a dedicated group of volunteers. Along with the Salina Salvation Army, Applebee’s, the Salina Country Club, and the GL Huyett company of Minneapolis all are instrumental in pulling it off. For the dinner 63 turkeys were cooked for the main course. And of course there were traditional side dishes including mashed potatoes, corn, stuffing, gravy, rolls, and pumpkin pie. There were 30 people helping to serve the dinner. Roxanne Matous from the Salvation Army, who herself had helped at the event for over twenty years, told KSAL News volunteers ranged in age from small children, to senior citizens. There were single volunteers, as well as large groups. The community-wide event attracted a very wide range of people, the homeless, those who live alone and are looking for a little companionship, and groups of families and friends who gathered to share a meal. As the restaurant began to quickly fill with hungry people, it also filled with laughter, smiles, and love. The Salvation Army Salina, KS, Applebee's Grill + Bar, and about 30 volunteers serve a free community Thanksgiving meal.